This is the time of year when we really rely on our garden for fresh greens. And there’s perhaps no more versatile and super easy way to implement use of fresh greens than a nice homemade batch of pesto! It’s great on bruschetta, it’s great on pizza, it’s great as a condiment, it’s great on pasta. 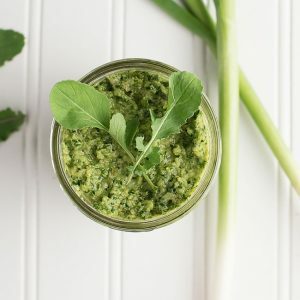 We have a variety of pesto recipes which we love including our Toasted Walnut Spinach Basil Pesto. 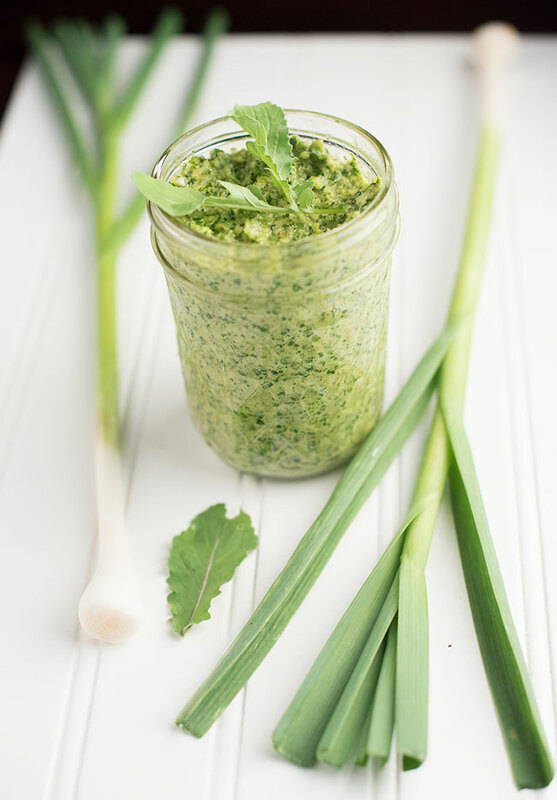 Today we’ll show you our latest pesto, a vegan gluten-free Arugula Green Garlic Pesto. We’ve been enjoying an extended wet spring in the Mid-Atlantic. My inner upstate NY self is loving it. My garden is also loving it. Peas, arugula, garlic (first time growing garlic!! ), lettuce, spinach, herbs, etc. are lasting much longer than previous years. Since it’s the first time I’ve grown garlic, I’ve been surprised at how easy it is to grow (although, it does not seem to be enjoying how wet it has been). We discovered garlic scapes last year at the farmer’s market (see our pasta with baby zucchini, and garlic scapes) and I have just discovered them sprouting out of our garlic in our garden. But, I had never realized you can use the young garlic — or green garlic like leeks — instead of garlic in dishes. So, of course, I pulled up a few to test it out. At first, I wasn’t sure what exactly to do with the green garlic. But then…light bulb moment…of course, pesto! We recently just finished our freezer supply of pesto from last year so the timing was perfect. Pesto is really a pretty versatile condiment, both in terms of what you put in it and what you put it on. 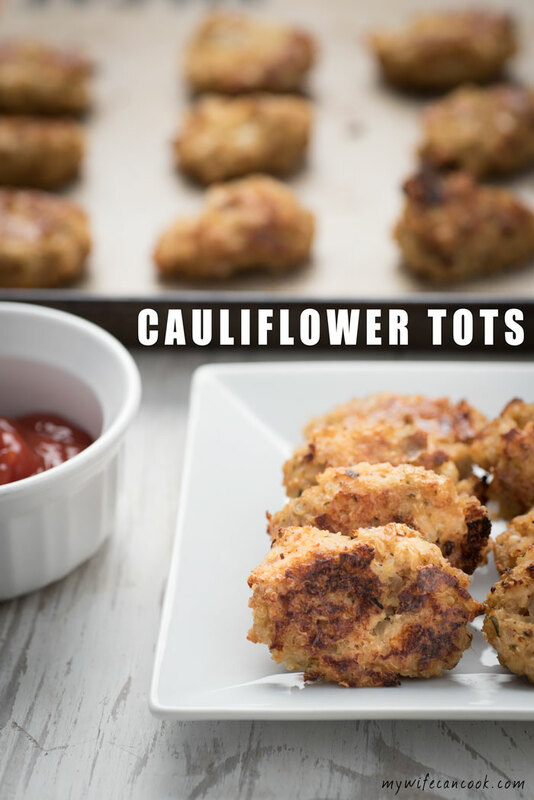 Plus you can freeze it in small quantities, pull it out in the middle of winter, and in a small amount of time, have the perfect appetizer or meal. In the middle of the summer, we stick with basil pesto, but at this time of year, my basil is just a little tiny plant. So, after looking around in the garden, I decided to do a spinach, arugula, and green garlic pesto. Really, you can do many combinations of greens! The other large part of pesto is traditionally pine nuts, but once again, it can be tailored to suit your tastes (or what you have in the freezer). It’s fully acceptable to use a different kind of nut or to have a pesto recipe with no nuts at all. It’s really up to you. We frequently use walnuts since pine nuts can be expensive unless we are stocking up somewhere other than locally. I’ve also been meaning to try it with something like cashews just to see how it would taste. And if you are vegan or dairy free, you can just skip the traditional parmesan cheese. This latest batch of pesto was consumed in many ways: on pizza, on bruschetta, as a late night snack on crackers. How do you like your pesto? Place all ingredients except oil in food processor. Add oil while running food processor until desired consistency. 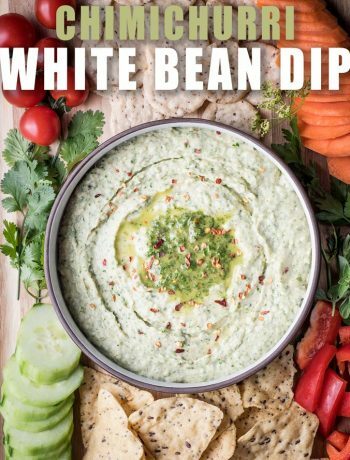 I love this twist on pesto!! Bet the arugula adds such a lovely peppery hint to this! It definitely has a good flavor! Oh this sounds gorgeous. I can almost smell the fragrance of it! Arugula is way too often forgotten, I bet it makes pesto fantastic. Mmm.. 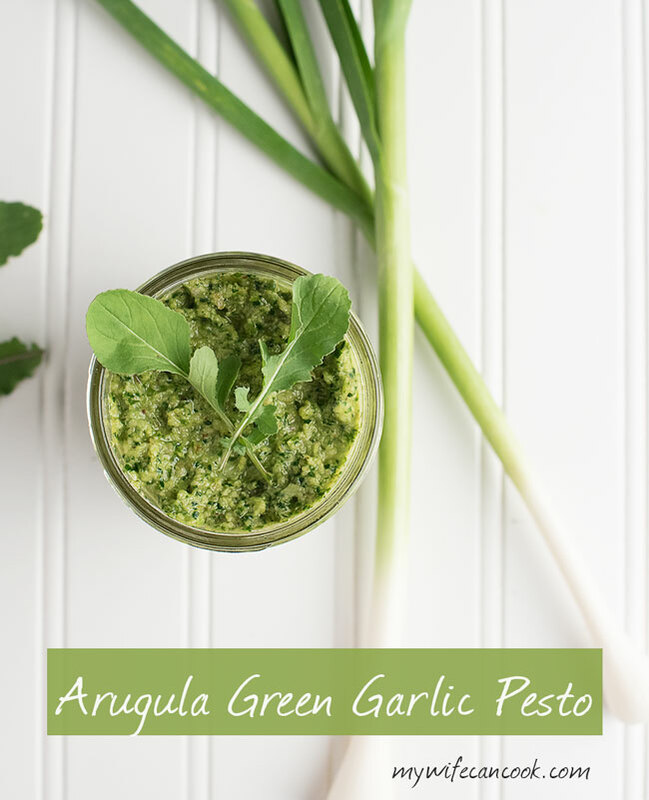 I bet that arugula goes amazing in this pesto! Adds a nice earthy tone to it! I definitely recommend trying arugula in pesto! We ALWAYS have pesto on hand. I don’t think we could go a full week without using pesto We have not tried an arugula pesto although we always buy arugula. We will definitely try the recipe. Thanks for the inspiration. You’re welcome. We definitely keep pesto on hand at all times!